Good news. We are going to attend German Hannover Messe in the name of our group company from April1~5. 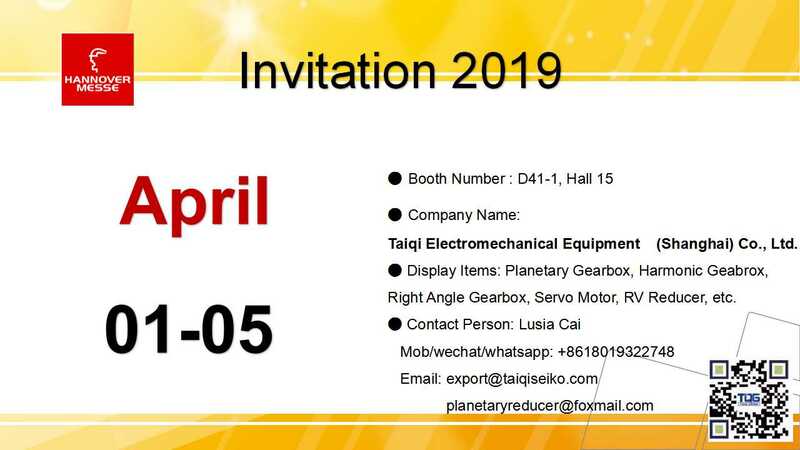 Welome to visit our booth and talk about our cooperation of low backlash gearbox face to face. Our company has been always expanding its international brand reputation by making advertisement and attending all kinds of related exhibitions to let more customers to know our precision reducer gearbox. We will show full range of products in the exhibition including low backlash inline planetary gearbox for servo motor and stepper motor, backlash free harmonic drive gearbox for robot arms, RV reducers for robot joints, servo motor, stepper motor, brushless motor, right angle bevel gearbox, hollow rotary table/ hollow rotary actuator, high torque right angle planetary gearbox for servo motor and stepper motor, grinded rack and gear. Welcome to our booth for negotiation and check our quality. Our booth number is D41/1, Hall 15. We are waiting for your coming and talk about our cooperation. Voice your requirement, and we will meet you. Know more information about our products, please visit our website or you can scan the following QR code to contact us. What factors influnce the efficiency of the servo planetary gearbox?